After noticing that gphoto is not packaged for maemo I did a bit of digging, seeing sad news from those who tried getting it going. But I thought I'd try with 2.4.6 to see if things are better now. For those who want to tinker, see my packages. The library came across OK but gphoto itself uses a newer debhelper, so I just plucked the binary itself into the repo. If you want to use this with libferris, then expand the additional libraries into /usr/local/lib/ferris/plugins/context on the device. Take a look at the links in this post, the will at least solve the lockup problems. 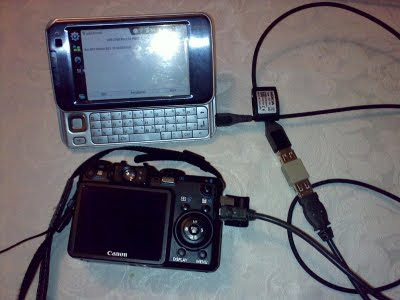 Hmm, reverting to OTG mode right after gphoto2 works ok for listing and getting a single file with gphoto2. Unfortunately it seems there is a race on there to revert to OTG before the device "notices". So using libferris I could copy an image over but there was enough delay after reading through gphoto and the script ending (and thus going back to OTG) to crash the device still.